I was welcomed to PHANTOM OF THE OPERA by the Broadway Across America Series for their final production of this season and I’m so glad I reached out to them. I wouldn’t put this particular show on any list of my favorites, but I have always appreciated the music and the spectacle of it. Well, this new North American tour is nothing short of spectacular. My friend who accompanied me asked if I was ever “wowed” by anything anymore, given that I get to see so much theatre. I stopped to think about what usually “wows” me; typically its a particular moving performance or an emotional story. I don’t get to see shows with huge budgets often enough to be “wowed” by a show. PHANTOM, however, wowed me. From the chandelier hanging from the center of the theatre at the start of the night to the continually surprising and impressive set, to the special effects, explosions, fire effects, and makeup all of the technical elements of this show absolutely came together perfectly to make this a theatre EVENT, not just another show. That’s not to say the performances were less than. I especially thought Julia Udine (“Christine Daae”) was on her game vocally and emoted well. Ben Jacoby’s “Raoul” was appropriately confident and proud, while tormented by having to do battle with the opera ghost. Both “Carlotta” (Jacuelynne Fontaine) and “Ubaldo” (Frank Viveros) brought the necessary humor to keep the early parts of the show interesting, and I’m always a fan of the dark, mysterious “Madame Giry,” played by Linda Balgord. She knows how to use that stick to really drive home a point. The Phantom, played by Cooper Grodin, was marvelous. Not a traditional phantom, in that he didn’t creep around the stage as much as I would have expected and his voice didn’t have the scary quality I would have anticipate, his soaring vocals especially on the grand finale gave me chills. And then . . . all of sudden . . . he’s gone! What a incredible special effects right up until the last minute. I am so glad I go to to see this amazing production. If its not sold out, you can too by going here to get tickets. PHANTOM OF THE OPERA at the Aronoff Center in Downtown Cincinnati until May 11th. Next season has been announced and information on how you can subscribe is available here. Utterly disappointed. We took a guest who had not yet seen the production and we are sorry we did. After much build up to them about the chandelier and especially Masquerade; it was heartbreaking to see the changes. Without Masquerade on the steps, it was very one dimensional, nor were the costumes the beautiful works of art of the past. 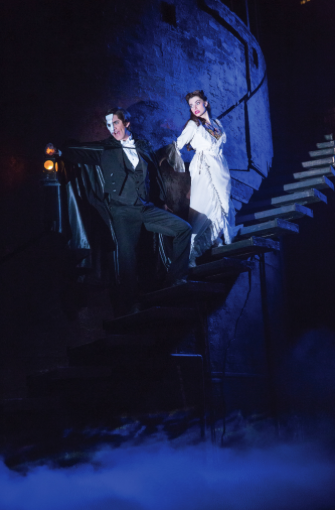 Those omitted scenes are what makes Phantom, Phantom. We feel Cooper Grodin’s voice was not as strong as many we have heard. I did appreciate the slower/clearer speech patterns, a novice could follow the plot quite easily. I loved the new steps! We have seen Phantom in Cincinnati twice, three times in Birmingham, once in Las Vegas, and once in the original playhouse in London. Very disappointed in this production and will not recommend it to anyone. Sorry you didn’t enjoy it. I don’t have the same obviously loyalty to the show and I like that a show can change and develop under different artists eyes. I loved the tech and thought the music was beautiful. Thanks for reading! !